Deepika and Ranveer were spotted together at the Ambani's Ganpati Celebrations.The duo looked amazingly attractive wearing traditional Indian wear. The much loved, much talked about pair of Bollywood may not confirm their relationship but their chemistry on and off-screen says a lot. 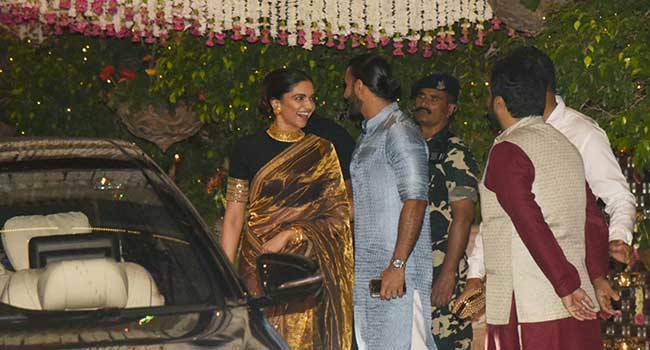 Deepika and Ranveer were spotted together at the Ambani's Ganpati Celebrations. DeepVeer lovingly addressed by their fans, looked very happy together. Their togetherness and PDA is not something new. But their recent public appearance together shows the steadiness of their relationship. We can easily say it is maturing with time but the couple is still not ready to talk about it openly. We must give respect to their privacy. It is their private life after all. Without much head storming the fans and readers must relish the lovely appearances they make. These stars give us major fashion goals. Ranveer Singh is known for his quirky fashion sense while Deepika is an epitome of elegance. She stunned everyone wearing a magnificent gold and black Sabyasachi sari and looked like she walked straight bout from the sets of yesteryear Bollywood. She looked like a dream in the gorgeous tissue sari. Her accessories added a lot in completing her look. Deepika's stylist Shaleena Nathani gave her a handcrafted gold choker along with matching gold earrings and bangles. The gold tone is perfect for attending events like Ganpati celebrations . Ranveer too kept it subtle and classy by sporting a sky blue kurta. Fashionistas take note carefully, this will help you in increasing your fashion quotient and get ready to attract attention in the upcoming festive season. Bollywood Star kids: Who do you think is the upcoming heartthrob of Bollywood?